When the worlds of nature and people converge, nature is often endangered. But in a strange twist, the manmade world of highways has favored the survival of cliff swallows, according to University of Nebraska ornithologist Mary Bomberger Brown. “Natural selection and human development have created a better bird,” she said. 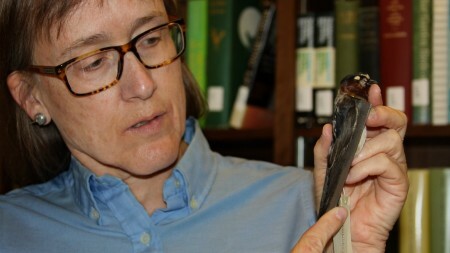 Bomberger Brown’s bold conclusion is based on her 30-year study of cliff swallows – one of the longest running evolution studies in the world. Cliff swallows are North American migratory birds. From March to September, they nest and breed in colonies ranging from Canada to Mexico. In winter, they migrate to Chile, Argentina and Brazil. Each year during the last three decades, Bomberger Brown and her colleague, Charles Brown of the University of Tulsa, have been conducting a detailed study of cliff swallow life along the roadways and waterways of western Nebraska near Lake McConaughy. Their findings show how natural conditions and human expansion have affected the birds. The Browns never set out to conduct an evolution study. In 1982, they began studying bird behavior on a premise related to the old English proverb ‘birds of a feather flock together.’ When the study began, the big question in behavioral ecology was, why do animals live in groups? Why are they social? Bomberger Brown explains, “Cliff swallows are one of the most social birds in North America. They all live together in large colonies.” The colonies are a natural survival strategy. Swallows are aerial insectivores, meaning they eat insects that they catch in flight. They bugs they catch fly in swarms, including mosquitoes, flies, midges, and leafhoppers. “If you live in a big community like swallows do, they share information – following groups of birds to the location of food, so they can feed more efficiently,” said Bomberger Brown. By nature, cliff swallows build their jug-shaped nests on the sides of cliffs or bluffs, as protection from birds of prey and snakes. They’re always close to water because the swallows build their nests from globs of mud they collect by the beak full. When the Browns began studying the swallows, most of their nests lined the bluffs along the shoreline of Lake McConaughy. In a 90 by 30 mile area, the Browns check around 80 active colonies each year. Each nest holds a pair of adults and 3-4 chicks. The average colony contains at least2,200 birds. But one colony is enormous – 6,000 nests – or about 34,000 swallows. 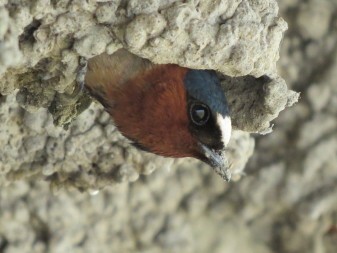 During the long-term study, Bomberger Brown has examined 317,000 cliff swallows. But soon after their study began, Bomberger Brown began finding that many of the cliff nests were abandoned. So, where did the birds move? Driving from one site to the next, she noticed a radical shift in the birds’ nesting preference. The swallows were forming new nesting colonies in the most unlikely places; beneath highway overpasses and bridges. The Browns wondered why this was happening. 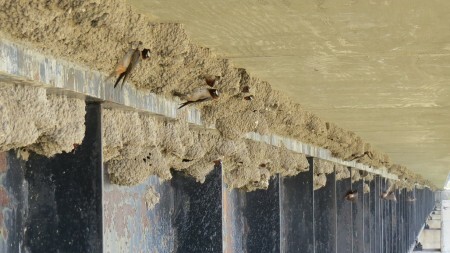 Cliff swallow nests under a highway bridge. By chance, their study coincided with a sweeping change in roadway design. A nationwide boom in highway and interstate construction was replacing old wooden trestle bridges with new concrete bridges and overpasses. Bomberger Brown soon realized that the swallows abandoned nesting on cliffs of loose, crumbly sandstone in favor of firm concrete structures that offered overhangs sheltering the birds from the elements. “We built them a better cliff, says Bomberger Brown, “and the birds flocked to them.” As the highways, expanded east and west, the birds followed suit. “You can now see them across the country,” she adds. “They’ve just followed people in their roadways, so humans have actually expanded their range – from ocean to ocean.” To track the birds, the Browns placed metal leg bands on the swallows to identify them. And to learn how the birds compare, they capture the birds to measure their bodies, beaks, wings, feet, and tails. But their new homes came with a risk. The highways were full of cars, trucks and RVs. “It’s an environment that can threaten their survival,” says Bomberger Brown. Soon, traveling up and down the highway, they found birds killed by cars. Examining each swallow, they measured the bodies and wings of each bird. 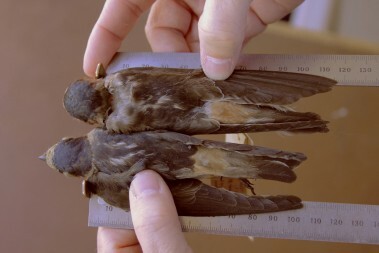 At first, they found about 20-40 road kill swallows. Ironically, with each year’s survey, the number of dead birds on the road was decreasing – at the same time that traffic and the size of cars were increasing. It was a curious finding, but the Browns were not sure why this was happening. Then, nature intervened with a catastrophe. On the last weekend of May 1996, four days of cold, rain and snow stretched east and west from Colorado to Iowa and north and south from North Dakota to Oklahoma. According to the National Weather Service, this was a freak May storm that had only occurred once before – in 1968. “Ordinarily, rain and cold wouldn’t seem like much of a threat,” Bomberger Brown explains. “Swallows can go for four days without eating – but they will starve and start dying on the fifth day.” Cliff swallows usually feed when insects fly, but that doesn’t happen in cold, wet weather. Cold, wet and starving, about 70% of the cliff swallow population died on the fifth day. 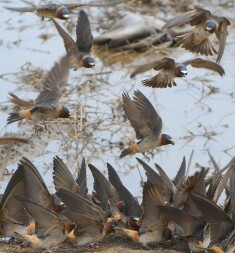 The Browns collected 1,856 dead swallows in the Nebraska study area. She estimates that throughout the region, hundreds of thousands of birds died. But not all the cliff swallows were wiped out. Some survived. It was a puzzle the Browns were determined to solve. The survivors’ shorter wings made them more acrobatic, like a fighter plane. Measuring each dead bird and comparing them to the birds that remained, the Browns made a surprising discovery. The birds that died had shorter bodies and longer asymmetrical wings. But the birds that lived had larger bodies and shorter wings. The survivors’ shorter wings made them more acrobatic, like a fighter plane. They were able to twist and turn, dodging oncoming traffic, especially larger vehicles like SUVs and Mac trucks. The road kill birds had been less agile. To understand how the swallows had changed, the Browns reviewed all the data they had collected on living swallows, those birds killed by cars, and those killed by the extreme weather. A clear pattern emerged. Both the birds killed by cars and those killed by the storm had long, asymmetrical wings. The survivors all had wings that averaged one half inch shorter. That’s a significant difference on a wingspan of four and a half inches. And it made all the difference between life and death. The Browns concluded that over the course of just a few decades, the wingspan of cliff swallows became shorter as an adaptation to avoiding oncoming traffic. The wingspan of cliff swallows became shorter as an adaptation to avoiding oncoming traffic. Almost overnight, the natural calamity of the extreme weather revealed an evolutionary adaptation in cliff swallows. Bomberger Brown chalks it up to an oddity in natural selection – not because the swallows changed – but how fast they evolved to adapt to a major transformation of their habitat. Typically, you expect population genetics to take millions of years. And while cliff swallows didn’t turn into different species, they have evolved through natural selection in a surprisingly short time – just 30 years. “In evolutionary terms, 30 years is an instant in time,” says Bomberger Brown. Yet her study shows that human development of roads and bridges across America have triggered natural selection to significantly modify the body structure and wing length of cliff swallows. Today, swallows thrive alongside people who literally zip by the birds. In a strange twist of fate, the survival of cliff swallows has been aided by the network of concrete highway overpasses and bridges that span North America. What this indicates is that selection can serve a purpose, and the long held theories that selection starts by accidents that happen to the organisms, and that are then occasionally found to be adaptive, have had it more or less backwards; and that if anything, accidental changes in environment are taken advantage of by the organisms for that organisms adaptive purposes. The relationship of the storm and all of the swallows that died from it is not presented so that the reader understands how it relates to natural selection or road kill. If late spring storms also favor the shorter winged, longer bodied birds, why hasn’t natural selection favored this body design over the millennia prior to the interstate highway system? The storm is part of the story but, the way it’s presented, it’s meaningless to the conclusions. Or, so it seems to me. Gary is a senior producer at NET Television. He’s produced documentaries worldwide, bringing science to audiences through TV, the web, museums, and schools. Gary has twice received the American Association for the Advancement of Science Journalism Award. His recent documentary, NOVA: Secrets Beneath The Ice, examines how researchers explore, drill and prospect to detect how Antarctica’s climate history can forecast Earth’s global climate future. His national productions include: NOVA: Ancient Refuge in the Holy Land, NOVA: Buried In Ash, NOVA: Edgerton and His Incredible Seeing Machines, Behind Lab Doors, Jungle Under Glass, Profit the Earth, Sexuality and Aging, and Seeking the Real Jesse James.